My name is Nfor Nwayuke Susungi. I was born on 31st August 1948 in the village of Tabenken in Nkambe Division (presently known as Donga & Mantung Division) of the former UN Trust Territory of British Southern Cameroons. Today December 5th 2010, I wish to solemnly declare that I am a candidate for the Presidential elections to be held in October 2011 in the Republic of Cameroon. The question is where does a person of my obscure background come from to aspire to the Supreme Magistracy of the Republic of Cameroon? The simple answer is that the time has come for me to seek this office because I must heed a call that was made to me 50 years ago. I am ready and God’s time is the best! Our big brother was a first generation politician of the British Southern Cameroons who was elected to the Eastern House of Assembly in Enugu Nigeria in 1951 and was also elected to represent the British Southern Cameroons in the Federal Legislature in Lagos Nigeria in the same year. His name was John Takinang Ndze. After eight years of loyal services rendered to his people, he passed away in 1958 when I was only 10 years old. But what I did not know was that he had infected me with the political bug before dying. When we sang the Cameroonian national anthem which begins with “O Cameroon thou cradle of our fathers” on 1st October 1961, I was a 13 year old primary school kid. But I knew and felt within me from that day that, one day, I would assume some important responsibility in this new country. We were told that at the moment of singing the Cameroonian national anthem on that day, we had become the citizens of a country known as “The Federal Republic of Cameroon”. That day was called “Reunification Day”. I believed it. I did not know what that important responsibility would be, or when and how I would get to it. I have never been driven by personal political ambition in Cameroon; I merely felt a powerful pull towards something inevitable. As we enter the Golden Jubilee year of that landmark event of 1961, I feel that I am finally ready. The presidential election is an important event in the Republic of Cameroon (as the country is called today), because the President of the Republic is a man who wields a lot of power. He has all the powers in his hands. Such powers can be used to do good; but history has shown that the accumulation of such powers, in the hands of one man, always leads to all kinds of abuses. When a single individual has exercised such power for 28 years continuously, that can compromise the future of a whole generation. Cameroon is not an exception to that rule. Indeed, disturbing signs are already visible everywhere. It is because of the sensitivity of this event that constitutional changes were made to give the president a 7-year term of office, so that once elected, he can enjoy peace of mind for seven years. But in making this constitutional change, no one anticipated that a presidential election would one day have to be held in the month corresponding to the Golden Jubilee of Reunification. But divine providence intervened to make it so. Consequently, as we celebrate the Golden Jubilee of Reunification in October 2011, the Cameroonian people must elect a new leader who will lead the Republic of Cameroon to a new future. I am running for the office of President because I am the Golden Jubilee candidate, by divine providence. Knowing that one day I might take the fateful decision to run for the highest office in the land, I learned over the years to watch, observe and look askance at the political and economic and social situation in Cameroon. I have been able to make some interesting observations about the country. · Do you know that the maximum security prison in Nkondengui is not the most dangerous prison in the Republic of Cameroon? · Do you know that the most dangerous prison is the one whose walls are built around you by yourself? · Do you know that the walls of these personal prisons consist of vague ideas which you easily accept without subjecting them to a serious stress test of validity? · Do you know that most Cameroonians are going around inside their portable prison cells and have thrown away the keys? · Do you know that, having thrown away their keys, it is now extremely difficult to free them from their prison cells? · Do you know that these ideas out of which the prison walls are built generally originate from an environment of poverty and hardship where there is a constant scramble for scarce resources? · Do you know that as your economic circumstances improve you will start attracting a different set of ideas which will begin to knock down these prison walls you built around yourself? · Do you know that in 1960 Cameroon, Cote d’Ivoire, Ghana and Nigeria produced respectively 73,000 tons, 93,000 tons, 433,000 tons and 195,000 tons cocoa? · Do you know that 50 years later, the cocoa production of Cote d’Ivoire is now at 1.33 million tons while that of Cameroon, Ghana and Nigeria are respectively at 200,000 tons, 590,000 tons and 185,000 tons of cocoa? · Do you know that Cote d’Ivoire produces 1,162,000 tons of rice while Cameroon only produces 62,000 tons? · Do you know that Cameroon imports 500,000 tons of rice per year? · Do you know that Cote d’Ivoire produces over 400,000 tones of raw palm oil while Cameroon does not produce up to 200,000 tons? · Do you know that Cameroon imports 50,000 tons of palm oil per year? · Do you know that Cote d’Ivoire produces 200,000 tons of rubber while Cameroon only produces 56,000 tons? · Do you know that the land area of Cote d’Ivoire is 322.462 km² while that of Cameroon is 486,000 km²? · Do you know that when Cameroon started producing oil in 1977 the government created an account known as “Compte hors Budget” into which oil revenues were kept and details were known only to the President of the Republic? · Do you know that the National Assembly which passes the Finance Law each year did not know how much money there was in the Compte hors Budget? · Do you know that Cameroon’s oil reserves have been completely exhausted? · Do you know that Nigeria’s oil reserves are 43 billion barrels; Gabon’s reserves are 2.5 billion barrels; Chad’s reserves are 1.0 billion; Equatorial Guinea’s reserves are 1.7 billion; Angola’s reserves are 10 billion barrels; Congo Brazza’s reserves are 1.6 billion barrels? · Do you know that Cameroon is now the poor neighbor in the Central African region and in the Gulf of Guinea? · Do you know that the reason why the member states of ECCAS don’t want to allow the free movement of people within the community is because they fear being flooded by poor Cameroonians fleeing their country to look for greener pastures elsewhere? · Do you know that the only countries in the world which allow visa free entry for Cameroonians is Nigeria and Mali, which are both in Ecowas? · Do you know that since reunification only 7% of Cameroonian roads are paved? · Do you know that the indigenes of Manyu Division, resident in Limbe and Douala have to travel through Bafoussam and Bamenda in order to get to Mamfe, as a result of the state of the Kumba Mamfe road? · Do you know that in spite of their isolation, Manyu, Meme, Kupe Manenguba and Ndian Divisions always vote 100% in favor of the CPDM party in the hope that the Biya government will one day construct roads for them? · Do you know that the Eastern province does not have even one single kilometer of tarred roads? · Do you know that 31% of Nigerian roads, 65% of Tunisian roads, 56% of Moroccan roads, 18% of Ghanaian roads, 21% of South African roads and 78% of Malaysian roads are paved? · Do you know that there are 13,514 people per doctor in Cameroon with more than 5,000 Cameroonian doctors working abroad and up to 600 in the United States alone? · Do you know that because the doctors in Cameroon are clustered in towns and cities, rural areas are often left with one doctor for 40,000 inhabitants? · Do you know that there are on the average 57 pupils per teacher in Cameroon, while there are only 22 for Tunisia, 36 for Gabon, 31 for Ghana and 19 for Malaysia? · Do you know that in the city of Douala 80% of the 50,000 Bendskin motorcycle drivers have at least the BAC and 50% have university degrees? · Do you know that according to an opinion survey conducted in the city of Yaoundé in 2007, 83% of young people aged 15-35 want to leave Cameroon? · Do you know that most young Cameroonians who go to study abroad have no intention of coming back home? · Do you know that Cameroon’s GDP under President Paul Biya shrank from $12.5 billion in 1988 to $7.8 billion in 1994, meaning that the economy contracted by 38% in 6 years under President Paul Biya? · Do you know that that is what economists call a depression? · Do you know that in spite of that, President Paul Biya was massively “re-elected” to a 7-year term in October 1997 and massively “re-elected” to another 7-year term in 2004? · Do you know that when President Paul Biya slashed public sector wages by 60% in 1993 the United States put US marines on standby alert because they were afraid that Cameroon was going to explode? · Do you know that Cameroonians are under the grip of a mystique force which has completely hypnotized them to a deep sleep? · Do you know that this mystique force is called alcohol? · Do you know that in spite of the economic crisis and the poverty which is ravaging the country, Cameroon is still the highest importer and consumer of champagne in Africa? · Do you know that the 320,000 bottles of champagne which the country imports every year are called “l’Eau de Bafoussam”? · Do you know that the Cameroonian armed forces which will celebrate the silver jubilee of their creation in Bamenda, has over 21 generals in active service who are over 65 years of age and most of them are busy running their private businesses? · Do you know that the corporate tax rate in Cameroon which stands at 38.5% is the highest on the African continent? 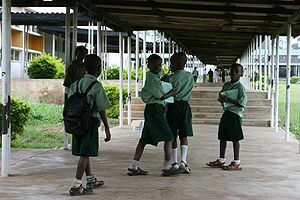 · Do you know that the Cameroonian National anthem says different things in English than it says in French? · Do you know that the refrain in the English version talks about “Land of Promise, Land of Glory” why the French version talks about “Chère Patrie, Terre Chérie”? · Do you know that when I sang “Land of Promise, Land of Glory” on 1st October 1961, I believed it? · Do you know that I have a Cameroonian biometric passport while the widow of the late President of the Federal Republic of Cameroon whom I listened to when he delivered the reunification speech on 1st October 1961 has no Cameroonian passport? · Do you know that all Cameroonians, without exception, are now deeply afraid for the future of the country? So my brothers and sisters, I am a candidate for the Presidential elections of October 2011 because I realized that the country has not yet delivered the “glory” which was “promised” to me 50 years ago when I was 13 years old. Have I not been patient enough? I decided to be a candidate because I do not believe that those who have been running the country are able to fulfill the promise made to us in 1961. I decided to go in search of this Promised Land myself because you should never make a promise to a 13 year-old child if you not intend to keep it. In presenting myself as the Golden Jubilee candidate for the presidential elections in October 2011, I want to clarify that I did not wish to oppose Mr. Paul Biya who has been President of Cameroon since 1982, after being Prime Minister from 1972 to 1982. I simply want to succeed him as head of the country in order to channel the aspirations of a new generation of Cameroonians to other horizons. President Biya has done his best for Cameroon and he cannot do more. President Paul Biya does not have the solutions to problems that will enable our children and grandchildren to celebrate together the centenary of independence and reunification in 2060/2061. I sincerely hope he does not make the mistake of running as a candidate to succeed himself. I sincerely hope he does not make the mistake of listening to the applause meter. Time for peaceful change has finally come. That’s the real issue at stake in the presidential election of October 2011. This must be understood. While many of our compatriots have chosen to flee the country for the reasons I have outlined above in order to seek greener pastures out of Cameroon by becoming British, American, Canadian, German or French citizens, I have decided that I must stay back and seek the promised glory in that land myself because I know that it is there somewhere waiting to be found. I do not condemn my compatriots who are in Diaspora because I know how much they miss their families, how much they miss their country, how much they continue to support their families and how much they continue to militate for change in their home country. For my part, I believe that the final battle for change requires physical presence on the ground in Cameroon. I concluded that the promised glory is there for anyone who wants to work hard to find it. This is a challenge which requires extraordinary political commitment. Together, we can transform Cameroon into a country which will no longer push its sons and daughters to flee for their lives. I sat down and worked on a document called “The Newcam Prosperity Pact”. 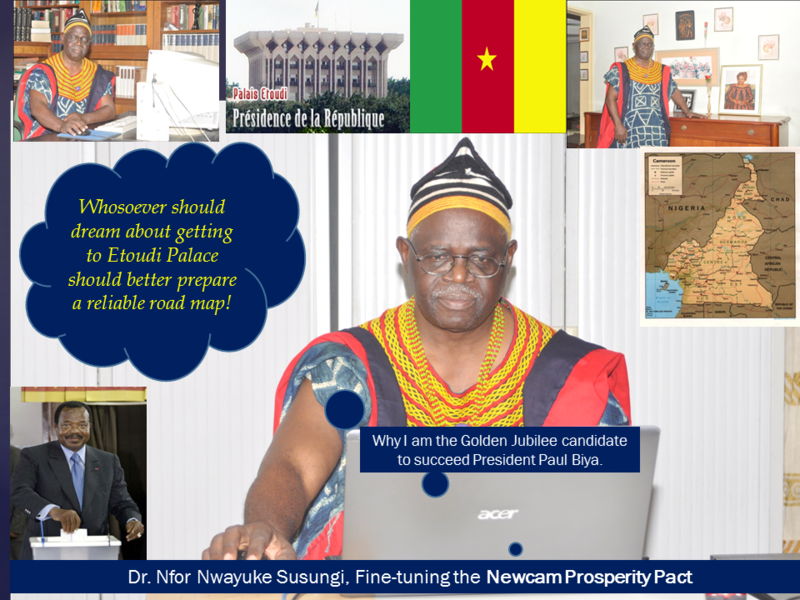 The Newcam Prosperity Pact is a very ambitious set of economic, political and constitutional reforms which I intend to implement if the Cameroonian people decide to vote for me in the Presidential elections of 2011. I realized that I cannot come out of nowhere and expect people to vote for me without telling them what I shall do when I am elected. I have also realized that corruption in government comes partly as a result of the fact that we tend to elect people to power without demanding to know from them what they intend to do when they get to power. We don’t push politicians to do their homework before coming to ask for our votes. Consequently politicians get to power with absolutely no idea of what they will do when they get there. They only make empty promises on the campaign trail: to build a dispensary here, a road there and to give a token appointment to one of your sons. Some politicians don’t even bother to come out to campaign because they are already sure of being declared the winner. Once they get to power, they start scratching their heads for ideas. In the meantime, corruption takes control. That is why Newcam Prosperity Pact is a very comprehensive programme which outlines what my government will be doing from day one. I want people to know that if I am elected, I shall take it that I have received the mandate of the people to do exactly what is contained in the Newcam Prosperity Pact. If I am elected, I shall introduce profound changes to the constitution within six months of my entry into office and the new constitution shall be adopted by referendum because the success of the economic programme of the Newcam Prosperity Pact is inextricably linked with the new constitution. In coming to you with the Newcam Prosperity Pact, my intention is also to set a new standard in public accountability. From today, when a politician comes to ask for your votes, please demand that he should present you his economic programme. Stop being taken for a ride by frivolous politicians who cannot do anything for you. In 1997 I was responsible for preparing and presenting to the Cameroonian people the economic platform of the SDF which was known as NESPROG. I gave the name NESPROG to this programme because I wanted a name which will always ring a bell in the minds of Cameroonians. It was the first time in Cameroonian history that a political party had ever attempted to present its economic platform to the nation. NESPROG was an economic programme which had room for a lot of improvement; but it had the merit of opening the eyes of Cameroonian people to the disastrous economic management of the Biya government. It also generated a very healthy economic debate nation-wide. This has not happened again since then. At that time Cameroon had just come out of the 6-year economic depression created by the spending spree of Biya government. Mr. President had just squandered everything which he found in the Compte Hors Budget. The country was heavily indebted and drowning. Today Cameroon has benefited from the HIPCs programme of the IMF/World Bank which was concluded in May 2006. But oil reserves have run out. So the question is what is this country going to survive on in the years ahead? Where is Cameroon going to be in the next 5, 10, 15, 20, 25 years? Will Cameroon survive to celebrate the centenary of independence and reunification in 2060/61? No one can be sure about this. Beyond the economic questions, there is also the also the issue of the foreign policy posture of Cameroon which has been characterized during the last 50 years by splendid isolation and diplomatic silence on the African and the international scene. Whenever the international community tried to take the diplomatic pulse of Cameroon, the country did not show signs of life. The country has always appeared to be diplomatically timid, mute and even indifferent towards its neighbors, including the closest. This posture has caused a deep prejudice to the interests of the Cameroonian nation. What do we intend to do in order to extricate Cameroon from this state of diplomatic autarchy? The answers to these questions are provided in the Newcam Prosperity Pact. It shall be unveiled to the Cameroonian people, the media, the diplomatic corps, political parties and civil society organizations in Yaoundé on February 11, 2011. Cameroonians across the country understand why we have chosen this date to unveil our vision of the 3rd Republic of Cameroon. Thereafter, the programme shall be successively presented to: (i) the students of the Buea University Center; (ii) the students of the Douala University Center; (iii) the students of the Dschang University Center; (iv) the students of the Ngaoundere University Center and (v) Municipal Councilors, Urban Councilors and traditional rulers from the Northwest and the Southwest in Bamenda. The issue in this presidential campaign shall be the future of our children and grandchildren. The presentations which I intend to make at the various university centers will enable the voices of our youth, which have been silenced and ignored for too long, to be heard. I promise to make it a landmark event in Cameroonian history because the Newcam Prosperity Pact contains ideas which will not only shake up the whole country but will also impact on Cameroonians from Kousseri to Mouloundou and from Meiganga to Bakassi. In unveiling the Newcam Prosperity Pact, our intention shall be to invite political parties to come together to form the Newcam Prosperity Group which will support the ideas embodied in the Newcam Prosperity Pact and also back the candidature of the Golden Jubilee Candidate. Membership of the Newcam Group shall be open to all political parties in Cameroon including the CPDM, SDF, UNDP, UPC, UDC, UFDC, LDA, AFP and indeed all political parties which are anxious to see a peaceful transition in Cameroon in 2011. However, those political parties which decide to propose their own candidates should better prepare their own economic programmes because the Cameroonian voters will demand to see their programmes before voting for anyone in 2011. My brothers and sisters, fifty years after independence and 50 years after reunification, 20 million Cameroonians are all incarcerated in a prison worse than Nkondengui. The only difference is that each of us built the walls of the prison cell in which we are incarcerated and threw away the key. Independence did not bring us freedom and reunification did not bring us unity. This is very sad. My brothers and sisters, the time has come for all of us to organize our collective escape from this prison. The roadmap to our freedom is contained in the Newcam Prosperity Pact. I am a candidate for the presidential election of October 2011 and for the succession of President Paul Biya because I believe that in terms of vision, my candidature will offer the voters the best choice at the polls in October 2011. Rendezvous on 11 February 2011 in Yaoundé.